For the 1 in 4 women to experience such a loss, it can be a difficult time. 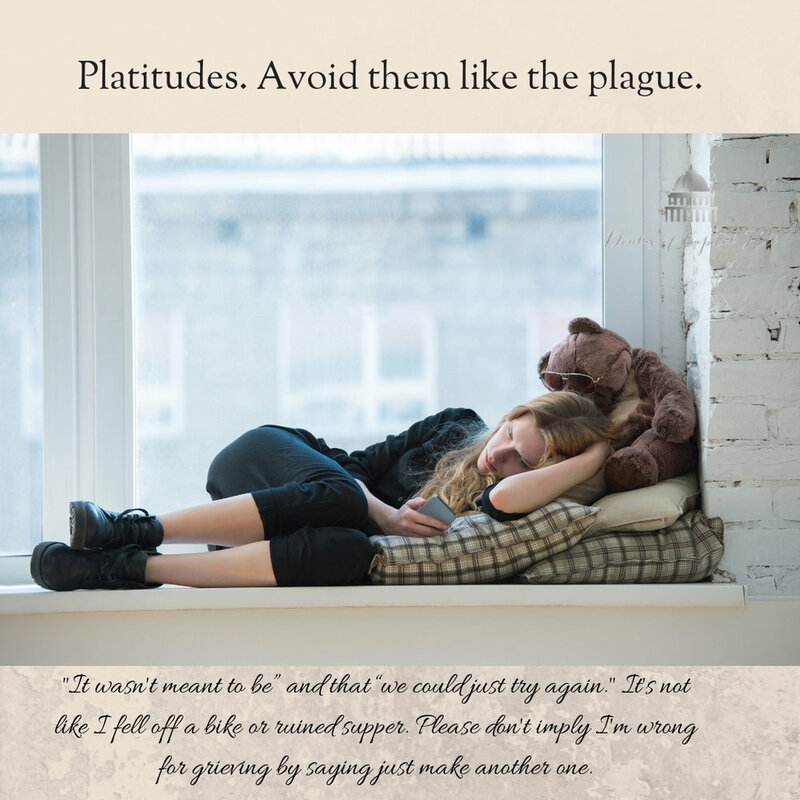 The people in our lives try to be there for us, but often times the results are less than helpful. 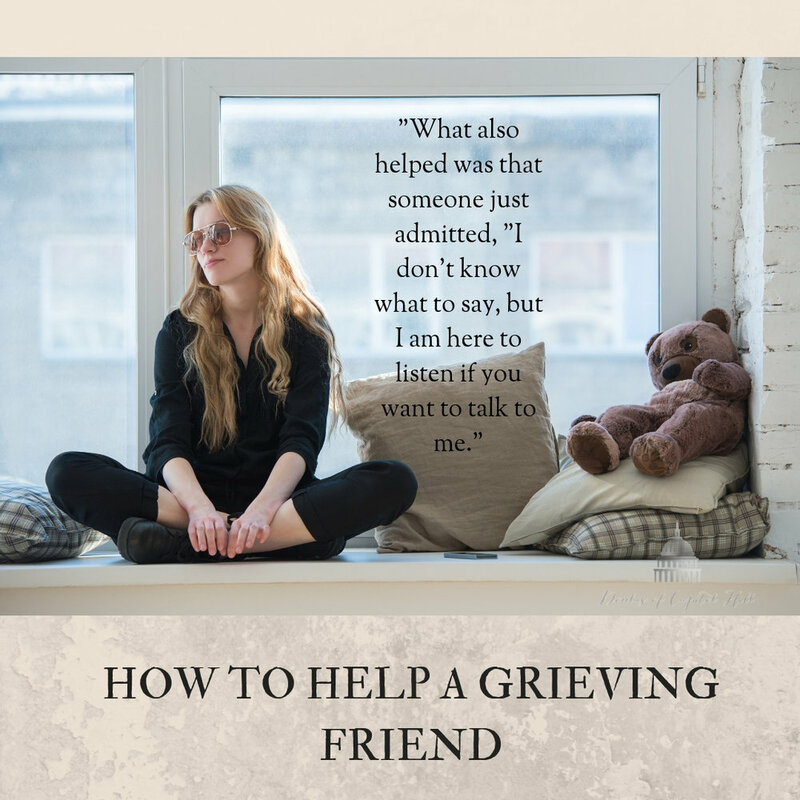 After reaching out to a number of women who have been open about their experiences with loss, many of them had similar unhelpful things said to them during a time they are grieving. For those of you who wish to avoid such awkward or potentially hurtful statements, have a listen to those who have lived through it. "At least it wasn't your first child" - after confiding about miscarriage, a baby we had tried 1.5 years to conceive. “You have two healthy kids, be GRATEFUL for what you have.” - I can be grateful AND sad, you can have both emotions BRENDA. “It will happen when it’s right”- what does that mean? "It wasn't meant to be” and that “we could just try again." It's not like I fell off a bike or ruined supper. Please don't imply I'm wrong for grieving by saying just make another one. “At least you lost the baby early. At least you have other children. At least you'll have more. At least you got to see the baby once before saying goodbye. Etc. “It wasn't a real baby yet.” -18 days there's a heartbeat. That's pretty real. ‘So you weren't that far along, you were only 8 wks.’- I cannot say whether this particular woman was trying to console me or marginalize my loss but in the moment where the pain is constantly in your throat and the idea of loss is besieging your heart; it felt like a dismissal....The thing is we don’t lose a pregnancy.. it’s not a matter of getting to 40weeks gestation, it’s a matter of having a family member, it’s a matter of an entire life, with ideas, hair color and temperament joining your world; the world. Loss can be difficult for people to sympathize with; even people who have experienced loss and all the more when the loss is only physically felt by one person (mom). Loss is loss, and losing your unborn child is complicated because their body is part of your body; and you essentially lose a part of yourself no matter how many or few weeks they were there. “You will be with her again someday (in heaven).” - So many of these are related to religious faith and unless you’re talking to a deeply religious person it’s terrible. And we don’t usually know how religious a person really is. “Just relax.” -are you f*@#ing kidding me?! I think mostly for me it was the silence that hurt the most… when people didn’t know what to say or do, so they pretended nothing happened or that I’m not really a mother. “I’m sorry for your loss” -The only thing to say. The most helpful, honestly came in the form of someone being there to listen, or just to be present with me in silence and support, the general act of gently moving forward in the present even if it's to visit them for three weeks and just being loved and needed. But what also helped was that someone just admitted, "I don't know what to say, but I am here to listen if you want to talk to me.